For breakfast we went back to basics and had porridge with whole milk. (We actually hadn't eaten this in over a week!) I added my favourite toppings of medjool dates, honey and cinnamon. Before eating anything I drank a cup of Clipper Rise & Shine tea (to help with digestion) and a bottle of water. Right before working out I did also make myself a black coffee...I don't think my morning would be complete without it! 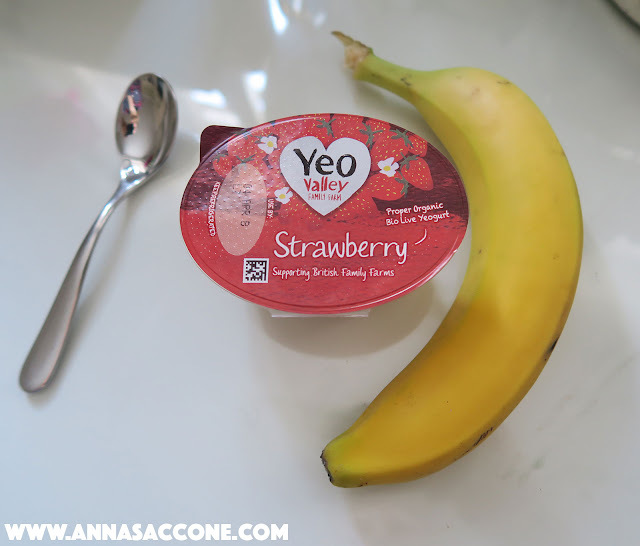 After my workout I had a banana and strawberry yoghurt. This is my favourite brand of the moment - Yeo Valley yoghurts are so creamy and delicious! I also drank another bottle of water during my workout. 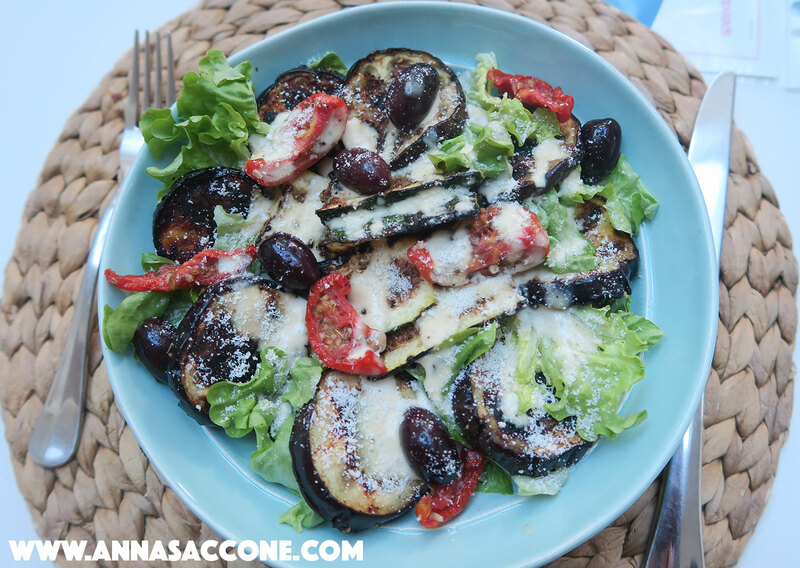 For lunch I had roasted aubergines & courgette salad with lettuce, black olives, semi-sundried tomatoes, parmesan and Caesar salad dressing. You can also make this with chicken if you prefer! 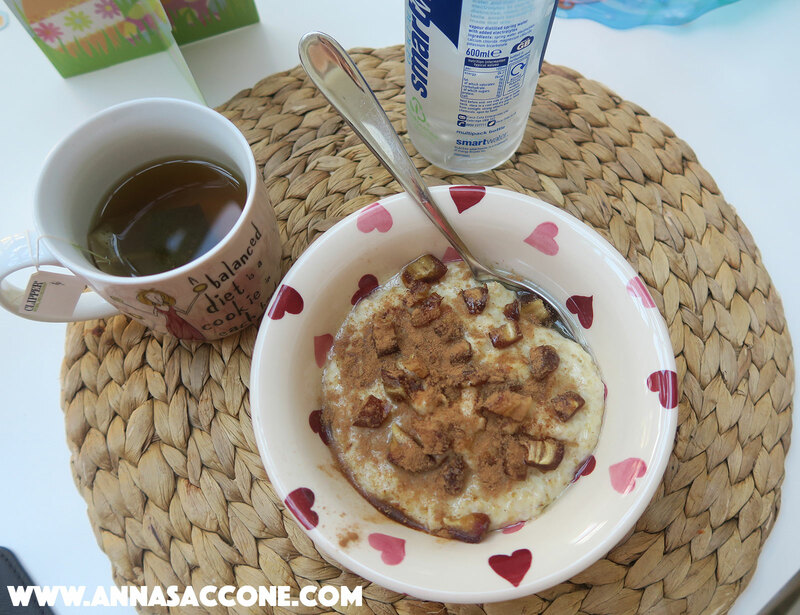 I feel like I always show the same dinner on here, or at least variations of the same thing...oops! I must try to switch things up a bit more. 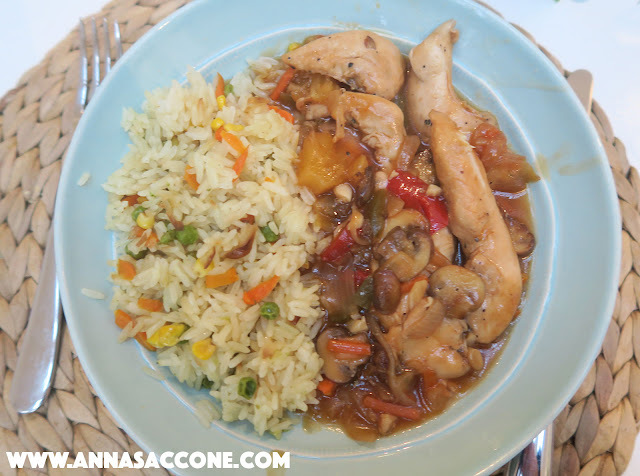 We had chicken with mushrooms and sweet & sour sauce (we use the Seeds of Change brand) along with rice which we made with mixed frozen veggies (peas, corn, carrots), onions and coconut oil. I also had another bottle of water with my dinner. After the kids go to bed I normally take my shower, change into my pyjamas and chill on the sofa surrounded by 700 dogs. I honestly look forward to this time everyday! So this is my time to indulge...ha ha! Tonight I couldn't decide between a cupcake & a cookie so I had both. 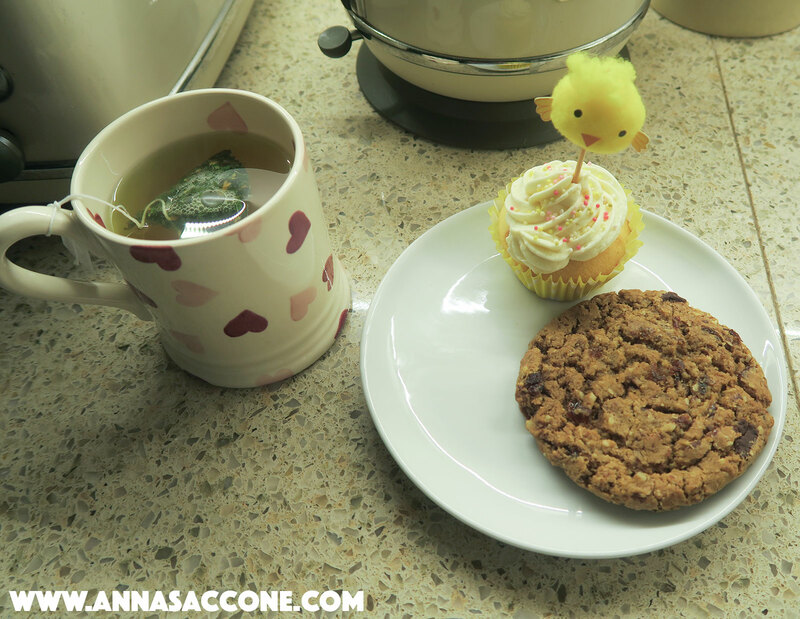 These cookies are the raisin & oatmeal ones from Waitrose bakery and they are SO soft! The cupcakes was one of our homemade Easter ones I baked last week. They were lemon flavour with vanilla buttercream icing and I think these are my favourites! 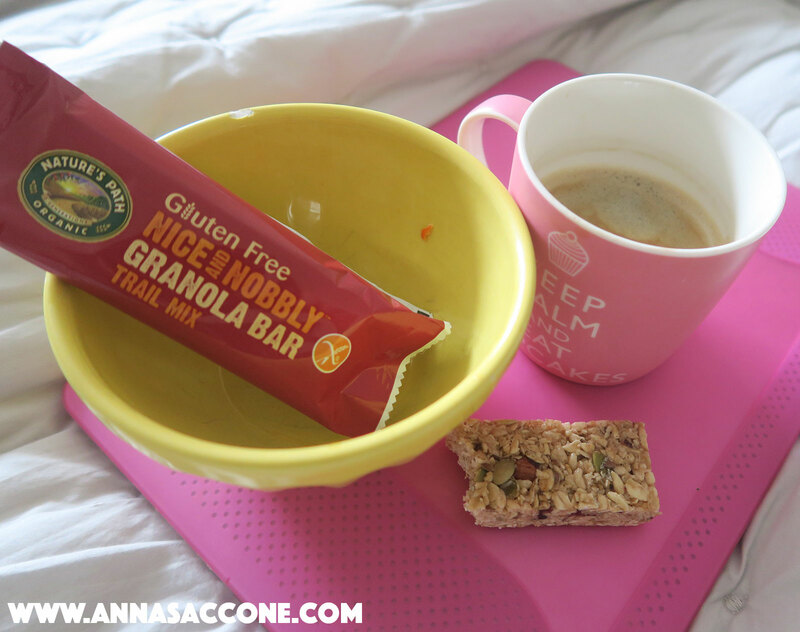 So simple but really yummy. I also had a cup of peppermint and licorice tea (Teapigs Sweet Treat) and another bottle of water. And that's it! What did you eat today? My husband and I follow the same ritual when kids go to bed. And I look forward to that time too! It's the best! Hi from Brazil! I absolutely love your channel and blog. I have a 4-month-old and have been watching your old videos. I honestly don't know how you do it all! Even with a maid to clean my house I have no time to cook whatsoever, and yet you did it back then with Emilia. You're such an inspiration. OMG that salad looked amazing, like I want that, right now, and it's 10:30 pm here lol. I am actually going to try making that this week it looks fantastic! I had raspberries with Total 0% fat greek yoghurt for breakfast. I use frozen raspberries as they are cheaper and last longer so when you mix it all together it tastes like ice cream! I don't like greek yoghurt on it's own but with fruit mixed in it's lovely and sweet. For lunch I had an instant cous cous sachet from Tesco as I didn't have time to sort anything else out before work. You just add hot water so it's easy to make in an office. For snacks I had an apple and a banana. I also got a latte from the canteen. For dinner I had quorn stir fry with noodles... and I'm about to scoff my easter eggs for pudding! Can you put the name of your workout video song in the description please. The songs are really good to get me in the workout mood!! The lunch looks really yummy. OMG everything looks so delicious, i cant even. Especially lunch and dinner yammy and healthy. I just love your blog posts :) stay positive! This looks like a good alternative!! You and your family are my favorite you tubers! You have been so strong after everything that has happened! I love you, your such an inspiration to everyone!